The Autumn Meeting on Sunday the 23rd October at the Worcestershire home of Deborah Powell’s Pard House Flock was a huge success. 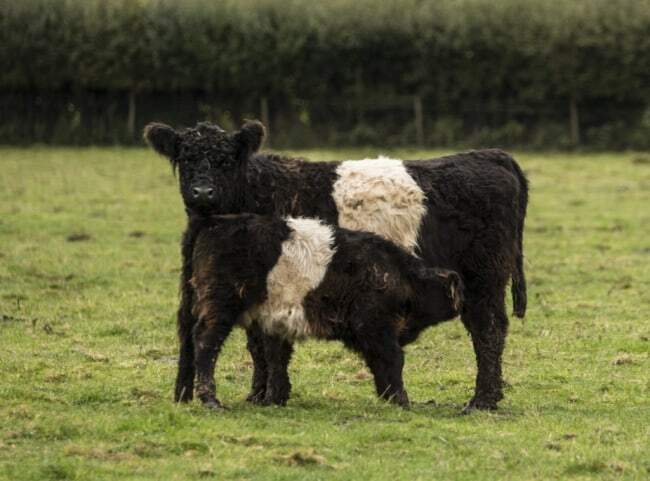 Not only did we have the opportunity to see David and Deborah’s Jacob Flock, but also their Belted Galloway cattle and a pedigree herd of Belted Welsh Blacks. A stunning heifer from their Belted Galloway herd had just calved. David and Deborah took everyone on a tractor and trailer tour of the farm and also showed John and Angela Pountney’s Woodgates Flock. It was a wonderful day. In the afternoon Stephen Harrison and Robert Price announced the results of the Flock Competition and the Presentation of the Central Region Young Handler’s Trophies. The Central Region AGM was also held at this meeting. All members are welcome at any of the forthcoming events. We are always pleased to see new members. Please contact Lucy Thompson, the Central Region Council Member, if there is anything she can do to help. Lucy is always pleased to hear from you. 2016 has been a very busy year for the Central Region. We started with an Open Day at the home of Jerry Strong and Lorna Hendey on the 15th May. The next event involved the Central Region representing the Society at the NSA event at Malvern on the 27th July. We are incredibly grateful to Mark and Margie Rushbrooke for storing and transporting the rather large and bulky Jacob Sheep Society’s stand. John Emberton had printed some wonderful photographs and eye-catching text. A really striking photograph of David and Lesley Partridge’s ram, Gobaith Star, could be seen from the other end of the building and certainly helped to draw in the crowds. Stan Taylor brought a pen of very pretty ewe lambs and Richard Chapman brought a very attractive ewe with a pair of crossbred lambs at foot, which created much discussion and interest. The next big event for the Central Region was the Show & Sale held at Worcester on the 2nd August. I would like to thank John Emberton and Jean Simmons who helped with the preparation of the Sale and the running of the Show. We were very grateful to Robert Price for judging the Show so efficiently. It was a really exciting sale with two sale price records being reached. The top price of 2,600gns was reached for the Trumper’s magnificent shearling ram, Beiliau Freddie, and close behind 2,550gns for the Partridge’s ram lamb, Bentley Stardust. 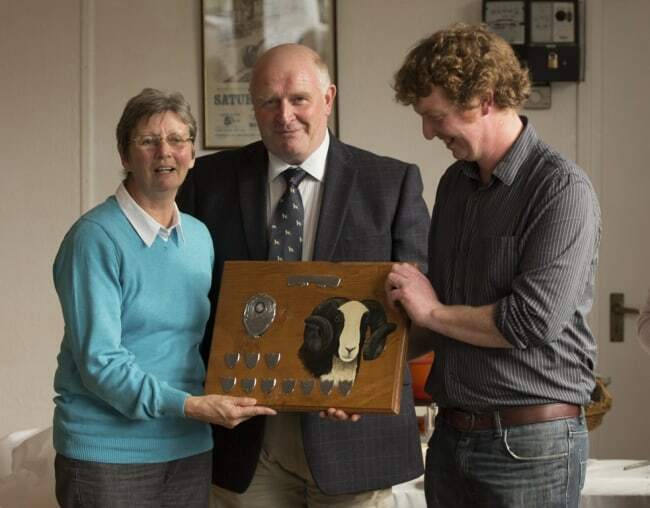 Many congratulations to the Jones family for winning the Supreme Champion with their ram lamb, Lower Argoed Rhodri and to the Partridge’s for winning Reserve Champion with their ewe lamb. The results were wonderful, many congratulations to everyone. At the beginning of October the Central Region held a Flock Competition. Stephen Harrison and Robert Price kindly agreed to judge the competition and many congratulations to everyone who did so well. 11.30am – Introduction and tour the Jacob Sheep Flock at the Farm. This will be followed by a tractor & trailer tour of the farm to include the Belted Galloway cattle. The tour will also include a visit to the Powell’s adjoining neighbours, John and Angela Pountney, who have the Woodgates Flock and have very kindly offered members the opportunity to see their flock of approximately 14 Jacob ewes. 1.00pm – Lunch at the Village Hall – [approximately a mile and a half from the farm]. The Central Region year began when over 70 of us gathered at an Open Day held in Elmley Castle at the home of Jerry Strong and Lorna Hendey on Sunday 15th May. Members from all over the region attended, but it was also lovely to welcome members from the Welsh, Southern, Northern and Scottish regions. We are so grateful to Jerry and Lorna for making the day possible. After gathering together for coffee and a tour of the sheep, Robert Locker gave a talk on how to select ram lambs for registration. Jerry and Lorna had provided a group of ram lambs which enabled Robert not only to discuss points for selection, but he could actually demonstrate each point with a live lamb and use lambs as a point of comparison. The talk not only was very interesting and informative, at times very funny and provoked many questions and much to discuss. After lunch Jerry had arranged for Kate Gunn, a professional trimmer, to demonstrate how to get sheep ready for the Show Ring. Again Jerry and Lorna were amazingly generous in allowing members to have a go at trimming some of their sheep under the watchful eye of Kate. It just showed how much everyone had enjoyed the day by the fact that they lingered long into the afternoon. Firstly I need to thank Jerry and Lorna, but also to Robert Locker for so generously travelling all the way down from Scotland to give such a fascinating talk. I would also like to thank Sue Britten and her son Tom for helping in getting the Village Hall ready on the day. Thank you also to the members of the Central Region committee for all their help in making such a successful day. The Central Region is taking a stand to the NSA event at the Malvern Showground. Richard Chapman is bringing a Jacob two-horned ewe with a pair of crossbred lambs at foot and Stan Taylor is providing a pen of four-horned lambs. We hope this stand will attract much interest. We shall be promoting Jacob Sheep and we will have a batch of catalogues for the upcoming Worcester sale to tempt any prospective buyers. The entries to the Show and Sale at Worcester have been incredibly strong with 180 lots. The Central Region Facebook page has advertised the event and it has reached 5500 people!!! It will be exciting to see what happens. This autumn we are holding our bi-annual Flock Competition and we are very grateful to Stephen Harrison and Robert Price who have agreed to be the judges. It will take place over the weekend of the 7th to 9th October and the closing date is the 23rd September. This will be held at the Worcestershire home of Deborah Powell’s Pard House Flock at which event we will have the results of the Flock Competition and we will hold the Central Region’s AGM. Everyone is welcome. Please contact Lucy Thompson, the Central Region Council Member, if there is anything she can do to help. Lucy is always pleased to hear from you. We are holding an Open Day at the invitation of Dr J. G. Strong and Lorna Hendey, at Elmley Castle near Pershore, Worcestershire. 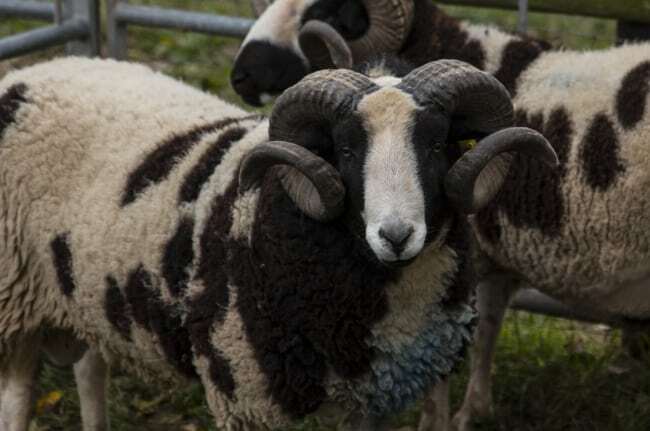 There will be an opportunity to look at their superb flock of Jacobs. The day will include a demonstration on how to prepare sheep for the show ring. Jerry and Lorna are very generously providing extra sheep so that members can “practice” on a live animal rather than just watching the demonstration. Robert Locker will be running a discussion on how to select ram lambs for registration. This will be a fascinating day and of particular help to new members. Application forms for the event will be sent out in mid March. The Central Region Committee will be taking the society stand to the showground and there will a selection of pedigree breed and crossbred Jacobs for people to look at. Please come and support us. Details will be publicised as soon as arrangements are confirmed. There will be another flock visit, this time to Deborah Powell’s Pard House Flock at Standford Bridge. Details have yet to be arranged and notification will be sent as soon as arrangements are confirmed. It will be at this event that the results of the Flock Competition will be announced, followed by the Central Region’s AGM. I look forward to meeting members at the forthcoming events and please, do feel free to contact me. I am always pleased to hear from you. Lets hope that the forthcoming lambing season will be a success for us all. After hosting the AGM we have continued to have an active and exciting series of events. The Central Show & Sale of Registered Jacob Sheep held at Worcester Market on the 4th August was once again a great success with another record making year. The total value of pedigree Jacobs sold exceeded £30,000, which was up on the previous year by 27%. Mark and Margie Rushbrooke hosted the Central Region Open Day on Sunday 13th September. Amongst the members attending we had the great pleasure of welcoming American Jacob Sheep members, Steve and Julie Blake from Vermont. The first event of the day was the Judges’ Seminar presided by the Field Officer, Gordon Connor. After the seminar there was a judging competition, which gave everyone the opportunity to get their hands on some sheep. Mark and Margie had penned three groups of three lambs: a pen of Charollais, a pen of Lleyns and a pen of Jacobs. At the end of the competition Gordon Connor, who had judged each pen in advance, gave out his results and the reasons behind his conclusions. A fourth pen had been provided with a lamb from each breed, and this time we had to guess the combined weight of the lambs. Not only was this great fun, but it also provided a platform for much discussion. After Mark and Margies’ delicious barbeque, we went for a farm walk. The Rushbrooke’s South Devon pedigree suckler cows and calves could not have looked more splendid with the sun on their backs as did the alpacas with their cria. It was really lovely day and we are most grateful to Mark and Margie for making it all possible. The farm walk took in their lake …. The Autumn Meeting held at Charlecote Park on Sunday 25th October was another wonderful day. There have been Jacob Sheep at Charlecote since the 18th century, and it is thought that this flock was the first to be introduced into this country by George Lucy in 1756. The National Trust was exceeding generous in hosting this event and our thanks go in particular to Adam Mayer, the Head Ranger and his assistant Nick Woodman. They had put a great deal of work in making the day such a success. We had a fascinating tour of the Jacob Flock, which was very impressive and we had glimpses of the stunning deer. Adam gave an extremely interesting talk about the conservation work being undertaken in the park and in particular the reinstatement of old meadowland. John Emberton has completed his second term as the Regional Council Member for the central region, a role he has undertaken for the past six years. John has done a wonderful job and the Central Region has benefited from his experience and hard work. We are most fortunate that John is remaining on the Central Region committee. The new Regional Council member is Lucy Thompson. Please do not hesitate to contact Lucy – the committee is here to help and support the members. 2015 was the year that the Central Region had the honour and pleasure of hosting the Jacob Sheep Society AGM. The Regional Committee welcomed members from Scotland, Ireland and the Isle of Wight. The weekend started with a wonderful visit to Chatsworth. 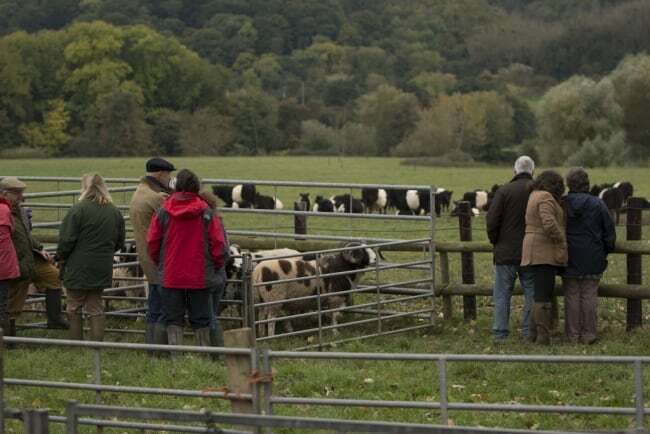 David Howlett, the Farm Manager at Chatsworth, gave us an interesting insight into the work of the farm and during the tour we saw the Chatsworth Jacob Flock and well as their stunning Limousin and Hereford cattle.. It was a very poignant visit as the former Duchess of Devonshire was one of the founder members of the Society and retained an keen interest in the Jacob Sheep Society throughout her life. The weather was perfect and the estate could not have looked more beautiful. Members then went to visit the house, which is an incredible experience for anyone interested in the arts. On Saturday after the AGM, members went to Culland Hall to view the Lleyn and Jacob sheep belonging to Simon and Lucy Thompson. Simon gave a talk on the benefits of performance recording and research into saliva testing as a method of determining sheep resistance to worm. Mike Harrison, a stick maker of many years, gave a fascinating talk about the skill of stick making. In the evening, after a drinks reception, we had a very enjoyable Gala Dinner at the Mickleover Court Hotel. We had the great fortune to have Ian Turner, the former Farm Manager at Chatsworth , give a most entertaining talk after the dinner. Ian has been enormously supportive of the Society during his long tenure at Chatsworth. On Sunday we visited Bev Parker and Ian Wooliscroft’s Needwood Flock of Jacobs, which were very impressive, along with their stunning Longhorn Cattle and horses. The weather forecast was wrong and it was again another beautiful day, with members relaxing and eating a delicious hog roast. The superb organisation of the day by Bev and Ian contributed to a wonderful finale to the weekend. The weekend would not have happened without the incredible hard work by the organising committee, John Emberton, Jean Simmons, Lucy Thompson, Bob and Paula Bramley, Hayley Higginson, ably assisted by Peter Simmons and Abbie Higginson. The Central Region Show and Sale of registered Jacob Sheep will be held on Tuesday 4th August 2015. The show will start at 9.30 am and Mrs Bridget Wilson will be the judge. If you would like to enter sheep for this sale, please contact McCartneys, 01905 769770 for an entry form or contact Grassroots. Entries must be received by Tuesday 30th June 2015. Late entries will not be accepted. Mark and Margie Rushbrooke have very kindly offered to host an open day and Judges Forum, which will be lead by Gordon Connor. Last year a proposed visit to Charlecote Park had to be abandoned due to Hurricane Bertha. The National Trust has very kindly agreed to host another visit and , once we have the date confirmed, details will follow. Every year in the Central Region we award prizes to the region’s children who have taken part in shows this year. For this we need to know the child`s name and age, which shows they competed in, if they were placed, what prize they won and if possible the Judge’s name. The sheep does not have to be the child`s own, but it does need to have been a Jacob! Any Young Handler classes entered can be included for this, as long as the sheep shown was again a Jacob. Hayley Higginson, Meadowview House, 162 Holmes Chapel Road, Somerford, Congleton, Cheshire, CW12 4QB. The entries need to be in by 26th October please. If you have any queries then please contact Hayley. The Central Region Open Day was held at Fir Tree Farm, Fillongley by kind invitation of Alan and Jane Nightingale. 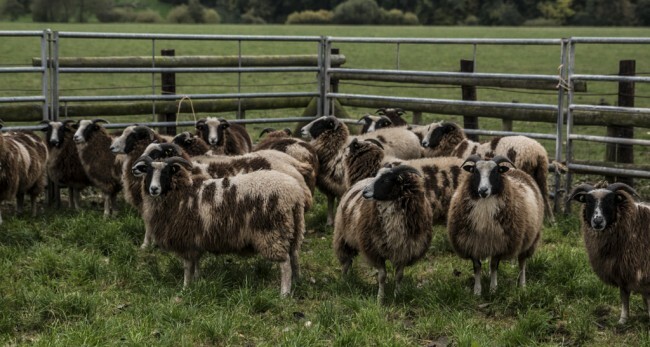 The Firtree Flock was founded in 2008 with the purchase of 5 ‘affordable’ ewes at the Worcester Show and Sale. Since then all ewe lambs suitable for registration have been retained in the flock to increase numbers with 19 ewes going to the tup in 2011. The day started with a drink and an introduction to the farm. On display was a particularly interesting forage analysis of the farm which Alan and Jane talked us through. Fortunately the weather was very good and we walked to a nearby field and saw the main body of the flock. On returning from the farm walk we went into a barn where eleven shearling ewes had been penned. They had been retained from last year and from these shearlings, half a dozen would be selected to join the flock. This was a very interesting exercise as it made all the participants assess the sheep and then have their judgements reviewed in the light of the judges’ comments. Jean Blacknell summarised the main points to the audience. Following the meal we were led by members of the committee and looked at basic sheep tasks, including turning a sheep, foot trimming and drenching using a gun. The activity was demonstrated and then members of the audience were invited to have a go, which they did. It was a very useful session, especially to those who had muddled through never having been taught the proper techniques. Every year in the Central Region we award prizes to the region’s children who have taken part in shows this year. For this we need to know the child`s name and age, and which shows they competed in , and if they were placed, then what prize they won, also if possible the Judges name . The sheep does not have to be the child`s own, but it does need to have been a Jacob! Any Young Handler classes entered can be included for this, as long as the sheep shown was again a Jacob. Please send entries by email to hayley@meadowland-flock.co.uk or post to Hayley Higginson, Meadowview House, 162 Holmes Chapel Road, Somerford, Congleton, Cheshire, CW12 4QB. The entries need to be in by 26th October please. If you have any queries please contact Hayley. The day had an excellent start with a hot drink, courtesy of PJ, and bacon bap welcoming the members, featuring Blackbrook’s own rare breed bacon. We gathered as John Emberton and Stan Taylor introduced the day and our hosts. The focus was on showing, from selecting the show stock, to washing and trimming and finally two ‘shows’, one with experienced handlers demonstrating how it is done and one with those new to sheep showing. The flock comprises of both four and two horns and a number of ewes and lambs were penned to one side of the barn and several were identified and looked at closely from the showing perspective. There followed a very interesting and informative debate between the experienced members about these points. Ben commented that he had introduced two horn sheep with a view to improving the conformation towards his ultimate aim of producing a commercial carcass. Selcting Lambs. Robert Price demonstrating the points to looks for. Hayley Higginson then demonstrated the washing of the sheep, working up a good lather. The photographer was poised to catch an action shot of the sheep shaking its coat at full lather but was disappointed as Hayley clearly had whispered in the sheep’s ear and it was behaving itself. The company moved on to trimming and four volunteer sheep were made available to the inexperienced trimmers amongst the audience, after a demonstration of how to do it by Richard Chapman. With great gusto and a little apprehension in some quarters but with great concentration, the snipping and teasing began. With guidance and encouragement progress was made and it was an excellent way to start learn the skills of sheep preparation. Having a go under Richard’s watchful eye. At this point the food for lunch was ready and we feasted on Ben and Tori’s Blackbrook burgers and sausages, ably supported with a salad provided by Jean Simmons, and followed by copious and sumptuous desserts. Delicious. Afterwards the attention moved to a pen of prepared ewes. Four were selected and they were shown by four experienced members. Judging was Chairman Elect Robert Locker and commentating on the process was Clive Richardson who had come down from the far reaches of Cumbria. It made a fascinating study as Robert went through the judging process and Clive explaining, very lucidly what he was doing and why. There were discussions about choices made and the variables that were balanced out in the judging process to make a final decision on the order the sheep were put in. Following this the four sheep were handed to inexperienced members and the judging process began again. There was help on hand, some subtle and some overt and even the sheep were decidedly co-operative. Although somewhat apprehensive at first, the handlers soon began to relax and start to ‘show’ their charges. Doing is by far the best way to learn. Some words of encouragement from Tori. The day concluded with more food, this time cakes as well as a hot drink, and the gentle conversation of friends. Without doubt it was a very good day for although it was in some ways set up for the inexperienced to learn under the guidance of the more experienced, there was also a discussion amongst the experienced members over anumber of points and issues that were raised. This was most interesting and stimulating as it opened ones mind up to other perspectives. There is a huge thank you for Ben and Tori for hosting the day, for Robert Price giving an insight into stock selection, for Robert Locker and Clive Richardson for their excellent work in the show ring, for Hayley Higginson and Richard Chapman for their demonstrations and for the food (Chief organiser of salads and puds, Jean Simmons: drinks – PJ Simmons) and general support that combined to produce yet another excellent open day. In the first week in September we held a Ram Assessment evening at Mark and Margie Rushbrook’s farm near Bewdley. Our expert was Nick Hart who is the veterinary advisor to the Charollais Sheep Society and conducts most of their ram sale inspections. The more than 25 members who attended were treated to a mix of theory and practical steps to ensure that we have the skills to select and nuture our rams to get the best performance from them. The thoroughly enjoyable and educational evening was rounded off with an excellent supper provided by Margie and Mark and our thanks are due to them for arranging this event. Central Region AGM and Open Day, Burcot. The sun shone, though it was a little fresh, as the members squeezed into the carpark at the village hall in Burcot. We were greeted as is customary with a warm welcome and a hot drink. There was a buzz of conversation and members gazed on the wool displays that filled the centre of the hall. At the appointed time, John Emberton gave a formal welcome and went through the formal business of the AGM. He commented on the two previous regional meetings, both of which were very successful and well attended. Plans are rapidly forming for next year’s events. After the AGM and a short break for refreshments, the whole company moved to John and Jacquelin Emberton’s farm, a short walk along the road. 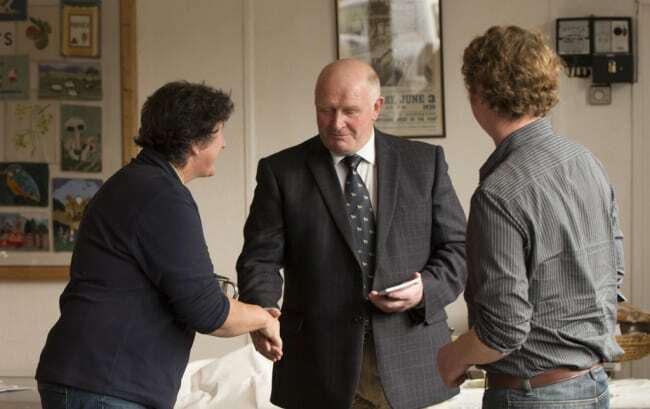 There we saw his flock and John explained how they organised their farm and managed the land. It is always so interesting to see how others keep their sheep and in doing so pick up ideas on how to improve ones own husbandry. Diane Hall spoke of the Wool Cup and encouraged members to join in. Her words were supported with a wonderful array of items. Anna Milner and Bridget Wilson gave the results of the flock competition and distributed the cups and trophies. They were thanked for all their hard work visiting numerous farms and making, in some cases quite difficult judgements because of the high standards. Lesley Partridge then talked in depth about fleeces and their preparation and gave a fascinating insight into not just what to do to prepare a fleece but also the reason behind what needs to be done. The detail of display that Lesley brought to the talk was amazing with samples of not only whole fleeces but small samples of different types of wool and hair found on Jacobs and other breeds for comparison as well as a magnifying glass. There were posters that contained masses of information, some just interesting some quite technical. It was evident that a lot of hard work and research had gone into the preparation for this talk – and it showed on the day. In addition to Lesley’s display, several members brought items to show and inspire the rest of us to get creative and working in wool. There was one ‘living’ display. Mrs Nancy Mole came along to the meeting with her spinning wheel. She quietly spun away during the day, extruding a fine filament of (naturally) Jacob wool, while answering questions and enjoying conversations with members. Gary Whitcombe watching the action. Note the jumper, made by hand from his own wool. It was a lovely day, a lovely atmosphere of gossip, learning and inspiration set in a wonderful laid back, gentle ambience. The way such days should be. Full marks to those who organised and ran the event. Author’s apology: There is a limited space for articles such as the above and so if your picture has not been included or detail that you would have liked been omitted, then please accept my apologies. I have tried to show a broad selection to give a taste of the day. The numbers at the regions shows were much improved this year. We have a lot of friendly experienced members who would be willing to help you if you would like to join in – please do contact any of the committee members. If you wish to advertise here please send the wording via e-mail as an attachment. All sheep offered for sale must be registered.